Today I have been looking for information about SSD disks because I am probably interested in using them for my future home-made NAS solution. 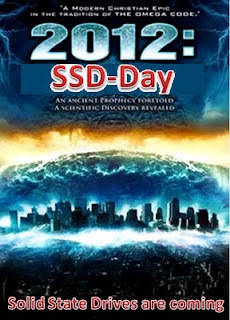 Having found this SSD topic pretty interesting, I have decided to write a post about it. Let's start form the acronym: SSD means Solid State Drives, which is a new technology spreading very fast and finally reaching the end-user. In general terms, SSD can be defined as a hybrid device which stores your data (as well as your Operating System, of course) in a semi-conductor device known as flash memory with no mechanical parts (no moving heads or spinning disks). The Intel 510 Series 250 GB is by far the fastest SSD around with 476MB/s read throughput and 325MB/s for write operations. Such speed require SATA III intrerface of course, being SATA II limited to 300MB/s. The Crucial RealSSD M4 256 GB is also a fast model, with 310MB/s for read ops and 273 for write ops. The Plextor PX-128M2S can read at 287MB/s and write at 195MB/s. Other models are a little slower with an average read throughput of 220MB/s and an average write throughput of 155MB/s. These scores are in any case much higher of those of mechanical hard drives, which have a average read throughput of 105MB/s and and an average write throughput of 103MB/s, plus the extra spin-up time. There are of course some disadvantages in this new technology that SSD designers and constructors are trying to workaround. Quite expensive for a NAS where you just wanted to store many TB of data, isn't it? Maybe better used as Operating System disk, even though you can already use a cheap USB key to start an OS like Freenas. Of course these were consumers SSDs with cheaper MLC technology but the outcome of the experiment has scared away many of us, I can tell. Another general concern is SSD maximum available size in GB. 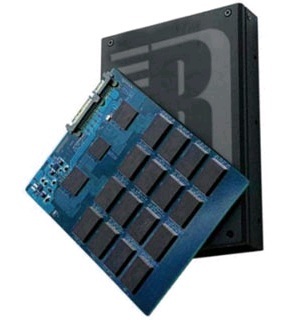 RunCore (a Chinese company) has released in December 2010 a big 3.5-inch SSD with a capacity of 1TB (2 x 500GB SSD drives and 2 x SandForce SF-1200 controllers). This SSD supports SATA III at 6.0 GB. The price? You better not to ask. So much for the theory. I spent some days watching videos explaining the advantages of SSD drives over HD and I am happy to share them with you, and maybe this will help you to decide whether to buy a SSD or just wait for 2012, year in which SSD are supposed to massively enter the consumer marketplace. The first video is Samsung SSD Awesomeness, where Paul took 24 Samsung SSD drives and put them in RAID-0 to test their speed and reliability to heavy stress. This video is very exciting for those interested in computer hardware assembly and, believe me, it is very very very funny. Another interesting video about SSD is the one by Samsung where the performances of SSDs and HDDs are compared. Seeing this video, it looks like Samsung is willing to become a big actor of the SSD industry. Intel has also made its video advertising the advantages of Intel SSDs, mainly for corporations looking to lower their Cost of Ownership. Another video from Intel showing the differences between SSDs and HDDs can be found here. A more technical video giving an insight of the technology is the one by Explaining Computers. In particular, the difference between Single Level Cells SSDs (faster but expensive) and Multi Level Cell (slower but cheaper) SSDs is explained in simple terms. Robustnesswise, you have to watch the Intel commercial video showing you that SSD drives are karateproof while HDD are not! Ok, you aren't probably going to your server room, pull out the disk bay and kick your hard disk drives as shown in the video, but it is a good robustness test indeed. 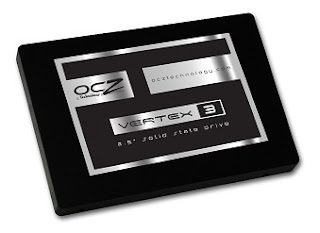 Digging even more, a video I enjoyed watching is the Consumer SSD Solid State Drive Buyer's Guide by Linus where three generations of OCZ Vertex SSD drives are compared to each other and a technical description of each is given. Linus does also a good job of explaining that RAID-0 SSD arrays are less risky than RAID-0 arrays made up of standard HDDs because SSDs are less prone to fail (even if nobody can guarantee that your raid controller will never fail...). Getting back to the technology behind, I appreciated this other video by Linus explaining with a good example how the TRIM operation speeds up cell deletion in SSD drives. As an added benefit, the TRIM operation does help SSDs reduce wear by eliminating the need for many merge operations to occur. Today TRIM is supported only by Windows 7 and by Linux starting from kernel 2.6.33.2. For the ones of you who like DYI and have some spare time, have a look at this pretty cool video where you can learn to change your old HDD in a fast performing SSD drive by raiding USB keys. Astonishing and pretty simple at the same time, even if it does not explain how to remove the "removable bit" from the USB keys in order to convert them in dynamic disks. This is all for SSD disks for the moment. I will start testing them pretty soon. In the meanwhile, if you have already tested some of them, please do not hesitate to share your opinion and to report performance, problems or whatever you fell like to share. This post rocks! It is exactly what I was looking for! Very informative. Putting specs together for a mid-range gaming computer and needed to know if an SSD was a good choice. Think I'll wait. Thanks for this post. Just bought a Crucial M4 64GB 7mm for a new NAS/HTPC!